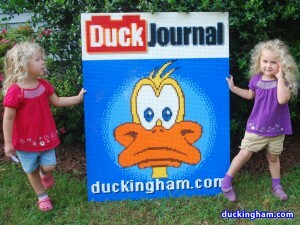 DuckJournal Magazine: For LEGO Duck enthusiasts everywhere! All good AFOLs (Adult fans of LEGO) know about BrickJournal magazine. After I built my Mime Magazine mosaic, I started brainstorming about other magazine titles that would be fun to cover as LEGO. 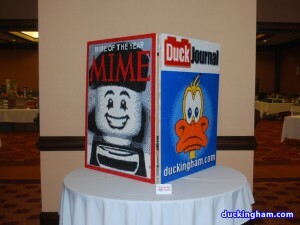 BrickJournal seemed to be an obvious choice, and mixing it up with a Duck followed pretty quickly. It’s not always easy to get an idea of the size of LEGO mosaics when all I do is include a photo of just the mosaic, so I got a little help from some of the little girls in my life (above) to give you a better idea.